BELOIT, Wis.— Roominate is an award-winning line of complete building sets that are designed for girls in order to bridge the gender gap in STEM. The line was started with one simple mission: open up possibilities for girls by showing them that creativity and engineering are fun. The success through the implementation of this mission has led Roominate to win many awards, including Forbes “Top 10 Toys to Watch in 2015,” TIME “Toy of the Year,” 2015 TOTY Finalist and many more. Emma’s Townhouse—Build a tall townhouse, or a wide one, either way you can design a colorfully modern home! Use the included motor to build a ceiling fan, or anything you can think of! Includes Emma doll and her pet pig Hodgkin. Ages 6+. 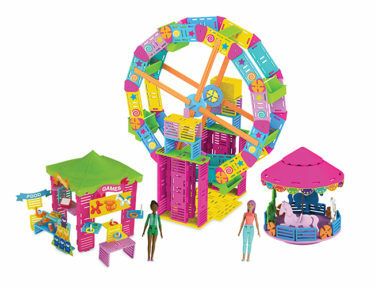 Cotton Candy Carnival—Build a fun Ferris wheel, carousel, swing, game tent and more! Includes two motors to bring rides to life, along with Bettina and Jenna dolls. Ages 8+. Zoey’s Pet Vet Van—It’s a mobile pet care unit that really drives! Includes one motor, Zoey doll, and five pets! Ages 8+. Cozy Corner Café—Create a relaxing café where dolls can just chill! Includes one motor and dolls Bettina and Emma. Ages 6+. Sophie’s Ice Cream Cart—It’s a fun addition to the café or carnival because who doesn’t love ice cream?! No motor included, but can be motorized with pieces from other sets. Includes Sophie doll. Ages 6+. Alice’s Mansion—Build this glorious house for dolls Alice and Bethany! Includes two motors so you can make the garage door open and close, the pool spin, an elevator go up and down, a ceiling fan, or whatever you dream up! Ages 8+. PlayMonster is a toy and game company that believes in the power of play to make a positive difference in people’s lives. Delivering great play value by designing, manufacturing and marketing quality products like the award-winning The Game of THINGS…®, 5 Second Rule®, Mirari®, Perplexus®, Don’t Rock the Boat™, Farkle, Chrono Bomb®, OK to Wake!®, Lauri®, Stratego®, Roominate™ and Wooly Willy® is how PlayMonster helps keep play alive for all ages.